www.example.com canonical name = url-from-cdn.cdnprovider.com. It should be redirected to https://www.example.com (this would technically be possibility #4). Option #2 works, since subdomain www actually takes you to CDN, and in there we have an enforcement to redirect you to https if you are coming from http . If you try to browse it, you would get site can't be reached error. 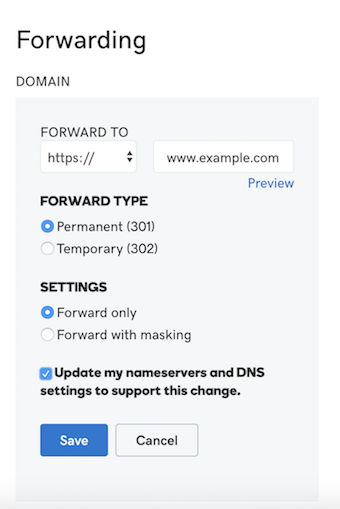 Since the A records are currently pointing to Google IPs, our first option was to change settings there, to update that 301 Redirect rule for HTTPS, and upload our SSL Certificate to enable 443 port. Unfortunately we found no way of doing that, so we analyze the following alternative. Currently GoDaddy does not offer ALIAS DNS record, and we cannot setup CNAME for Naked Domain because of RFC1034 (section 3.6.2). An ALIAS record is a virtual record type, which we could say is kinda a mixture of A and CNAME, where following our example, we could add a record for the naked domain example.com to url-from-cdn.cdnprovider.com and if we do a nslookup example.com we would see the ip from url-from-cdn.cdnprovider.com . So its like having an A record, that automatically updates the IP value. Note: After several support contact with GoDaddy, they are not able to add our SSL Cert (which we bought it from them), which would solve the issues. And yes, they use a nginx as well. Technically, what we could do, is create an A record with the IP we got from CDN Provider, 11.22.33.44. This might work, but it’s not recommended at all…because we don’t have control at all of that IP. If our CDN provider changes that IP, we will have to manually update the A Record, with downtime until we do it and propagates. We ended up deploying our own nginx server in our GCP Kubernetes Cluster, with a STATIC IP Address we reserve in GCP, which we have control and we know it won’t change. We use Bitbucket as source repository with Bitbucket pipelines as CI, so we created a new repository for this. We reserve an static IP in GCP that we are going to use in the nginx controller service (LoadBalancer type). IMPORTANT: This IP needs to be regional, and in same region than the GKE Cluster. Being 123.45.67.89 the IP reserved in step #4. You need to specify either a rule or backend, even though it will not route it there because the redirection happens before. There are many other options/features you could enable/configure. Either if you want a different redirection, or if you don’t want to redirect maintaining the request_uri …anything that matches your needs! 7. Once you finished validation, you are ready to update the A record in your DNS, using the IP we got from step #4. Thanks to Leandro Martin Soler and Matias Páez Molina.